Describing this novel in one decent sized review will never ever be enough to express how much I love Sarah J. Maas and her books. Having just met her only a couple of weeks ago when she visited Auckland, New Zealand for her Queen of Shadows book tour I am obviously still shaken up by the experience and how much more amazing she is (and totally gorgeous!) in person. Not to mention that she said to me as soon as I walked up to her, "You're so beautiful, oh my gosh!". If you don't believe me I will have a video up on my channel to prove it which I will link here on this post once it is up *flips hair confidently*. Basically everything that I had dreamed of about this series had come true in this wonderous six hundred page novel. That doesn't make sense now really but when you read it, you'll totally find yourself agreeing with that bold statement. More blood, more sass, more vengeance and more romance. This book is literally the best one out of all four (not including the novella of which I haven't read yet so I'm hoping Allen & Unwin will be nice to me one day and send me a copy). 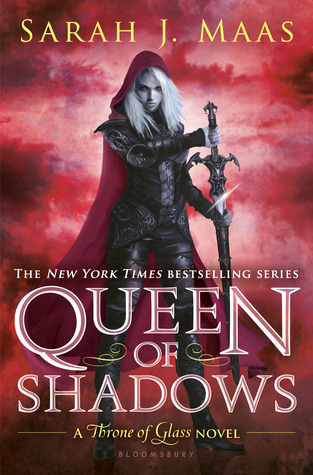 Thinking of what could happen next is a total mystery to me as there are no clues that I noticed while reading Queen of Shadows to hint very much about what will happen next apart from the obvious when you get to the end. SPOILER ALERT IF YOU HAVE NOT READ THE FIRST THREE BOOKS YET! : Celaena Sardothien now goes by the name Aelin Galathynius and she makes a hell of an appearance when she returns from Doranelle. A lot of things are at stake, including family and friends and little does she realise what her sudden outburst in Heir of Fire convinces the King of Adarlan to do in spite of the Queen of Terrasen's actions. Aelin and Chaol finally see one another again although things are still tense and Chaol has more struggles of his own. Trying to find his way after having sent Aelin to the safety of Wendlyn did not go as planned once he realised what the King was fully capable of and decided to take the risk of becoming a rebel. There is a lot of tension and catty arguments which might break you into laughter as it did to me. This novel definitely has all the right sass, love and heartbreak that every other ToG book had, just times that by a thousand. * Lysandra is basically Aelin's soul twin and I love her! She is introduced as an old friend from when they were in the hands of Arobynn Hamel, King of the Assassins. At first she isn't welcomed to easily but the differences of her personality are noticable to Aelin and therefore begins to trust her a bit more. She's just the friend Aelin needed after being so torn from Nehemia's death. * Aedion is the best cousin ever and he's so loyal to Aelin! Obviously Chaol's plan to save Aedion is somewhat of an event in this novel so it was quite interesting to see Aedion's reaction to Aelin saving him and Aelin's reaction to his cousin. In four words I would describe it as - It warms my heart! * Manon is a serious badass and may even have a soft side! Elide is a new character introduced in QoS and Manon seems to notice something different and special about this new young girl. Having much more trouble with her second, Asterin, than usual, Manon takes the time to figure out Elide and develop a little sense of empathy towards her. This is definitely something I wanted to see and everything that develops from that is simply so awesome! * If you thought Heir of Fire was dreamy and made you swoon over Rowan Whitethorn, wait until you read Queen of Shadows! Only Sarah J. Maas knows how the story ends up but I just always felt like Rowan was exactly the type of mate that Aelin needed. They are very close through spending so much time together in Wendlyn and finding out that they were each other's carranum, but in the fourth installment they begin to realise that the way they feel together is much more than that and a blood oath. The answer to how that goes down is basically in this novel and that's just the thousandth reason why you have to read it! Overall, I have rated this book (yup, you guessed it) a five out of five stars. It could not have gotten any better and the way Sarah is able to use descriptive words in such a delicate way that it melts your brain into an overload of amazingness and inspiration (how else could I explain it? Her writing is beyond words really!). As much as I tried to stall reading this so it could last longer I didn't managed to savour it well because I could just not put the book down. If you would like to be completely blown away into a whole differet dimension of fantasy and romance then pick up this book, retreat to your happy place and do not leave until you have devourered it with your body, mind and soul. Okay not the first one but you get what I mean. Sarah J. Maas is a literature Goddess and I will never ever take that back.